When it comes to mobile computing Microsoft's philosophy is if you can't beat 'em, join 'em. Microsoft is no longer trying to create exclusive experiences on its mobile platform. Instead, the company is taking up the philosophy that its software should run on everything regardless of the operating system – including iOS and Android devices. The easiest way to bring Windows 10 to your smartphone is with the Windows 10 Phone Companion App. Joe Belfiore, Microsoft's Corporate Vice President, Operating Systems Group, first blogged about the "Phone Companion" app for Windows 10. Now that it's out, the app is a guide to integrating certain Windows 10 features, like the digital assistant Cortana and OneDrive, with an iOS or Android phone. The first thing to note is that much of this improved integration works if you have – and actually use – OneDrive, Microsoft's cloud storage product. OneDrive is really nice, by the way. An easy way to get more paid storage is to subscribe to Office 365, which gives you access to the entire Office Suite, as well as a healthy bit of storage in OneDrive. The photos you take on your phone can be uploaded to OneDrive and then appear in the Photos app that comes with Windows 10. It allows you to see, on your computer, the pics you took on your phone. It's also a great way to do a backup without any work on your end. You can store music on OneDrive and stream music on your smartphone. Note the sequence here for the easiest experience: You store the music on OneDrive; create your playlists on your Windows 10 PC or tablet; then use the Groove app (on your phone) to stream the music, in the same way you now use Spotify, Pandora or other music service. In this case, though, it's free and streams your personal music collection. On top of that, Microsoft uses OneDrive behind the scenes for several features on its other apps. Any notes you make on your Windows 10 device with Microsoft's note-taking app, OneNote, will appear on your phone. If you change that note on your phone, the changes will be replicated on your Windows 10 device. Any work you do on an Office document on your phone can be automatically synced across all your devices via OneDrive. The other big integration is with Cortana, Microsoft's personal digital assistant. It is similar to Apple's Siri or Google Now if you're familiar with either of those services. Cortana is available as an app in both the iPhone and Android app stores. 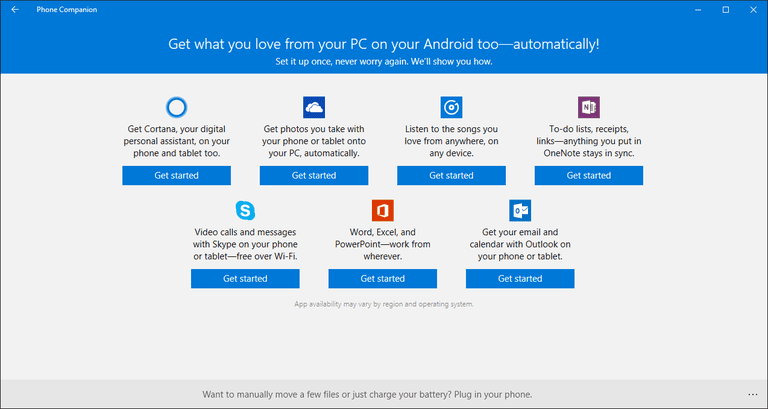 Phone Companion on your PC will help you find and install the app for your device. Cortana can help you set up reminders, add appointments to your schedule, look up information on the Web, and so on. One of our favorite features is the SMS feature that lets you receive and reply to text messages on your PC. Cortana for Android can also send you app notifications from your phone to your PC. These notifications are enabled on an app-by-app basis meaning you can prevent yourself from being overwhelmed by having a flood of unnecessary notifications on your PC. Cortana on Android and iOS offers some great features, but there are some differences with the Windows 10 Mobile version. For example, the "Hey Cortana" voice command doesn't work on iOS. Although Cortana for Android recently regained this feature after Microsoft previously rolled it back due to system conflicts. Using "Hey Cortana" on Android can make it easier to use the service when you're on the go. Windows 10 is a great operating system, and integrating your mobile device with the Microsoft ecosystem – including your Windows 10 PC – really improves your computing experience.